According to the verified data given by TUIK (Turkish Statistical Institute), overall sales in Turkey might be seen on the table below. The country has kept the increasing trend during all the years almost. In 2018, 1.375.398 apartments were sold in total in Turkey. Istanbul has always been the most demanded city in Turkey both by local and foreign investors. It has ups and downs over years, due to some crisis dealt like economic instabilities. Yet, it is predicted that the city will keep having the increasing trend the following years. In 2018, 234.055 apartments were sold in total in Istanbul. 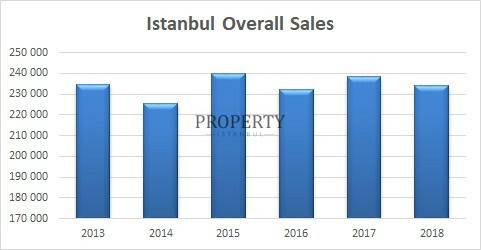 Overall sales made in Istanbul has an equal distribution to first sales and second hand sales as can be seen in the table below. One of the very informing and interesting fact is that, mortgaged sales, which allow buyers to finance the payment plan with bank credits, has decreased crucially the last year due to the high interest rates banks started to request. In 2018, 111.203 brand new apartments were sold through developers to buyers whereas 122.825 resales occurred in Istanbul. Only 21% of these sales were mortgaged sales. Istanbul has some trending districts to invest on real estate that are mostly developing and promising. Esenyurt especially, which involves numerous brand-new projects, has had a huge demand by buyers for the last 5 years. Beylikduzu, Basaksehir, Pendik, Sancaktepe are the ones following Esenyurt with significant amount of sales as well. After the change in the regulation in 2012, Turkish Government has allowed all nationalities to buy properties in Turkey. 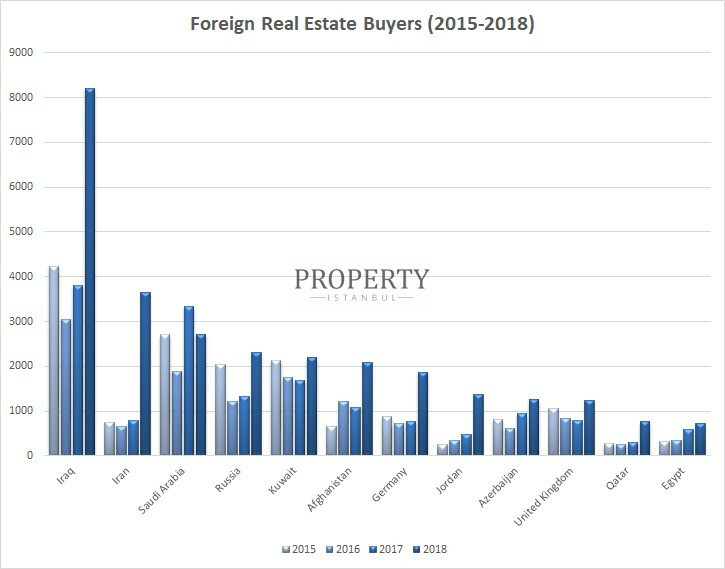 It has created a huge interest on foreign investors and it hit the peak point in the year 2018, thanks to the fact that Turkish Government has started granting foreign buyers, that will pay a property for more than $250.000, with the Turkish Citizenship. Foreign investors are interested especially in Istanbul. 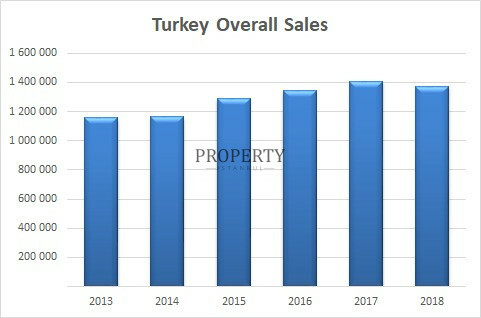 As can be seen in the graphic below, they have had a trending interest in buying properties both in Istanbul and Turkey. 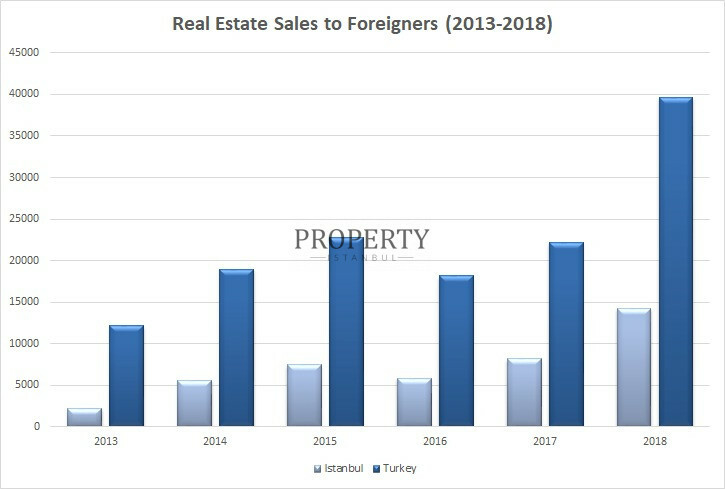 In 2018, 14.270 apartments were sold for foreigners in Istanbul and 39.663 in Turkey. Iraq, Saudi Arabia and Kuwait have always been in demand of properties in Istanbul since the change in the regulation. In 2018, Iran has showed a huge interest also with an increase in purchases by more than 300%.